The following is a guest post by A.C. Burch, author of The HomePort Journals. His new book, A Book of Revelations, will be released by HomePort Press in June of 2016. With the upcoming launch of my book of short stories, I’ve been thinking a lot lately about the genesis of my first novel, The HomePort Journals. My transition from musician to author was somewhat of a distraction in those early days. I was unsure of my writings skills. My principle focus was on my characters, and, looking back, there were certain parts of the book whose origins were a bit of a revelation. I’d like to share the three primary sources that found their way into the story without much effort on my part. They turned out to be essential components, and I hope you’ll enjoy learning more about them. One of my favorite scenes in The HomePort Journals is when Lola Staunton, heir to a vast whaling fortune, insists that Marc Nugent drive her to Herring Cove Beach in Provincetown to greet returning whales that migrate each year to Cape Cod Bay from Southern Waters. Lola is an elderly recluse who rarely leaves her mansion; Marc, a young man from Manitoba recently arrived in town. The whales have returned to feed. In March, before there are too many boats about, they swim so close to shore you can hear their breath. Let’s join Marc and Lola as she makes her annual pilgrimage of atonement. “As you wish,” Marc says, starting the car. At the beach, a squabble of seagulls huddle face to the wind. Farther offshore, a brace of mergansers dive for food. Beyond them, five whales glide majestically through the sparkling waves. Marc stops to watch a young calf swimming close to its mother’s side, changing course as she does. Two of the largest whales sound, and then he sees the telltale circle of water that indicates they are feeding. The air fills with birds diving for prey pushed upward by a bubble net. There are no cars in sight as Marc traverses the length of the lot, yet he knows to await further instruction before choosing a parking place. “I guess this is as good as any,” Lola says, pointing to an isolated spot. Marc pulls into the space just as the largest whale raises its tail and slaps the water…The whale raises it a second time, making Marc wonder if Lola’s apology has actually been acknowledged. 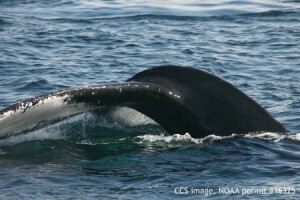 Provincetown has had a long and varied association with whaling. It was a major port in the early days of the industry when whales were plentiful near shore. Some homes around town even had two whalebones forming an arch over the path to the front door. Oil from the heads of pilot whales was refined in town to be used as a lubricant for precision instruments. Ambergris, secreted by the Sperm Whale was used to make perfume. A local man, known as the Ambergris King, was so skilled at its value he could set the market price based on smell alone. 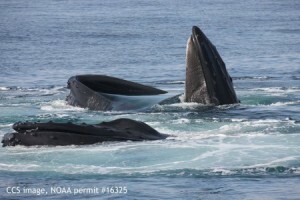 Whale-watching got its start in Provincetown in 1975. The Center for Coastal Studies, whose stunning photographs are included here, pioneered techniques used in the rescue of entangled whales. These methods were based on skills passed down by the crew of Provincetown whaling ships. And the vibrant Portuguese community in town is mostly descended from crews recruited from the Azores to sail on Provincetown whalers. Then there’s my personal association: My ancestors owned one of the largest whaling fleets in New Bedford, traveling all around the world in search of prey. For nearly 30 years I’ve gone to Herring Cove when the first whales arrive to offer penance for my family’s incursions. Given that, it was natural that Lola Staunton would do so—and share my guilt by ancestral association with the slaughter of such magnificent creatures. This also brings to mind The Whales of August, the superb 1987 film starring Bette Davis and Lillian Gish. I sometimes smile to myself as I await the whales’ return. I wonder if, in my nineties, I’ll still be peering out at the harbor from my upstairs window anticipating the first sighting of the season. What is it about us as humans that we so eagerly await the completion of cycles? The coming of spring… the first rose… the Whales of August. I believe that, far more than we realize, we are grounded in these rhythms, finding reassurance in the continuity—perhaps even glimpsing our true place in nature. Much of The HomePort Journals deals with the mystery and ramifications of the disappearance of a young woman just a day after giving birth. 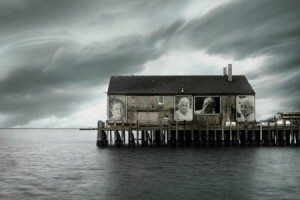 Provincetown’s history provided fertile grounds for those scenes set over one hundred years ago. That part of the book practically wrote itself—Provincetown people keep their stories alive through oral history, and I’d been paying close attention for decades. My wonderful Portuguese neighbors—elderly wives or siblings of fishermen—shared gossip and scandal with me for years, their eyes glinting mischievously as they exchanged knowing glances. The excerpt below, when Annie’s disappearance is being discussed by Marc and three elderly women, came to me as if these dearly departed friends had convened for one last round of tea and scandal. Marc is trying to bring Lola some peace by finding out what actually happened. Let’s listen in as Lola’s father, Captain Staunton, is accused of a murder that allegedly occurred more than 80 years before. I owe my elderly, Portuguese neighbors an incredible debt. Without them, there would have been no mystery to solve. Since I first visited Provincetown at the tender age of 13, I’ve had a powerful affinity for the place. In my 20’s, I came for day trips at every opportunity. Having lived here now for nearly 30 years, I can say without hesitation that this place is where I was meant to be. 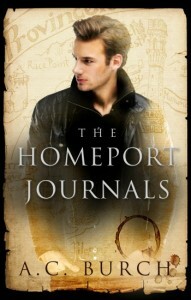 I believe The HomePort Journals—and the sequel currently in the works—are part of that destiny. In fact, I don’t think it would be an exaggeration to say were it not for Provincetown, I would never have become an author. There is so much to this town though it’s less than 3 miles long and but ½ mile wide. The variety of creative and crazy characters that love it so: the incongruous mix of fishermen and drag queens, gaping tourists and brilliant artists, and of course, the writers, past and current: Eugene O’Neil, John Dos Passos, Norman Mailer, Mary Heaton Vorse, Eileen Myles, Heidi Jon Schmidt, Michael Cunningham, William J. Mann, Jeannette de Beauvoir, R.D. Skillings… I could go on and on. How to do justice to such a special place? How to make it a compelling home for my widely diverse group of characters? These questions fostered terror when I began to write The HomePort Journals. There are literally (no pun intended) thousands of books from and about Provincetown. What would be my unique contribution? I love this town as do so many others. What could I say that had not already been said? We P’Towners, for reasons we barely understand and often question, find that this little strip of sand delivers a long-sought sense of contentment and connection. Community is too narrow a description. It’s like being an integral part of the whole, in tune with its natural rhythms—aligned with its frequency. This alignment can foster a near-mystical engagement that can liberate a writer. The most inconsequential of conversations can yield or re-energize one of your characters. And as for inspiration… hardly a day goes by in Provincetown without my being seduced by the incredible beauty of the light and water. There seems to be some new, breath-taking image nearly everywhere I look. And I never tire of looking. The challenge for me became how best to incorporate the essence of Provincetown into the story of a group of outcasts who overcome great odds to become a family. Partway through writing the book, I realized that, much like the whales who traveled thousands of miles—and just like me as it turns out, my characters were inexplicably drawn here. Love of this place would be their common bond. 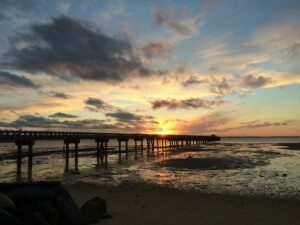 Provincetown can be a writer’s paradise. It took Marc Nugent, himself an aspiring author, a while to learn that lesson. But that’s only because I had to learn it first. The key is to let where you live become an integral part of your life. And if the place can’t meet that demand, take yourself somewhere that can. Once I understood the incredible importance of this lesson, I was no longer afraid for Marc’s character—or myself. Out of Lola’s (and my own) ritual of return and atonement came a major theme of The HomePort Journals and a new, joyous chapter in my life. The recipe is deceptively simple: Find the place where you intuitively know you belong. Savor and honor it every day—in all its dimensions. Then, much like the returning whales each year, you’ll be steadfast in your purpose, certain of your role in nature, and—no matter how far you may roam—confident you know where to find your true home. More about the author and his work: A.C. Burch’s Website. A.C. Burch is a long-time Provincetown resident who spent his early summers on Cape Cod and since then, the sand has never left his shoes. His first visit to Provincetown sparked a romance with the town and forged a love of the sea that continues to this day—most summer days will find him sailing on Cape Cod Bay. A.C. trained as a classical musician, but his passion for the arts extends to photography, the art scene in Provincetown and Miami, as well as the written word. His literary icons run the gamut from Jane Austen to Agatha Christie by way of Walter Mosely and Patrick Dennis.